Christians are urged to love their fellow Christians by showing hospitality, remembering those in prison or those who are being mistreated, keeping the marriage bond intact, being content with what one has, honoring leaders and teachers and following their examples. Jesus tells a parable that illustrates humility. 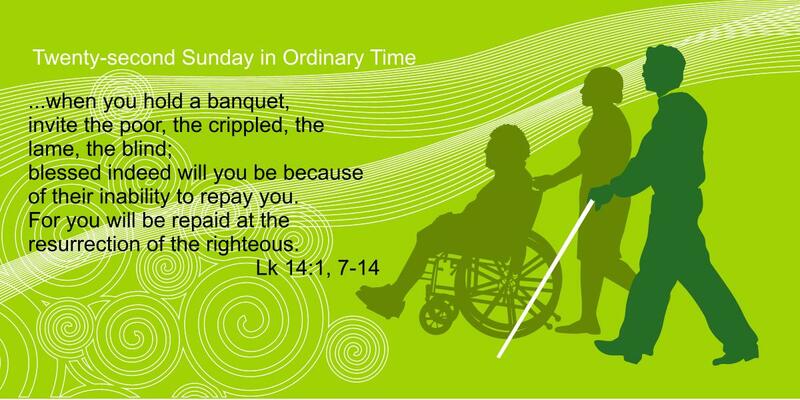 He also says, “When you give a banquet, invite the poor, the crippled, the lame, and the blind.” We will be blessed because they cannot repay. True hospitality consists of taking care of those in need for the sake of the kingdom and expecting nothing in return. Hospitality must be the hallmark of the Christian congregation. The stranger is greeted and brought into its life, and those in need are heard and responded to in the name of Jesus Christ. How would you define humility? Edward Hopper, “Nighthawks” (1942, Art Institute of Chicago) The alienation of modern urban life is suggested in Hopper’s Nighthawks. The shadowy apartment buildings and shopfronts in the background appear gloomy and silent; the only light seems to be coming from the all-night diner. The weariness and passivity of the patrons contrast with the energy of the soda jerk who serves them, as he creates a space of hospitality in a threatening, lonely city. Identify some individuals who exemplify true humility for you. What are the challenges we face in our contemporary world in order to live in such a manner? In both the Gospel and Epistle (2nd lesson), readings, life in the community of faith is contrasted with life in the world. What changes are we called to make in our lives if we are to reflect God’s Kingdom? This entry was posted in Baptismal Covenant, Ordinary Time and tagged Baptismal Covenant, Faith, Jesus, Lectionary. Bookmark the permalink. 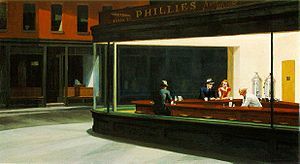 I will never view “Nighthawks” again without thinking of this interpretation. Thank you for this inspired reflection.